Tim is a lifelong St. Charles County resident. Born and raised in St. Charles, he graduated from St. Charles West High School. Following high school, he received his undergraduate and juris doctorate degrees from Mizzou. Following law school, he began the private practice of law in St. Charles, with a general law practice, for 12 years. During his years of private practice, Tim also served as the assistant Prosecuting Attorney for the City of O’Fallon, the Prosecuting Attorney for the City of St. Charles, and the first-ever Municipal Judge for the St. Charles County Municipal Court. In 2010, he was elected to serve as an associate circuit judge for the State of Missouri. 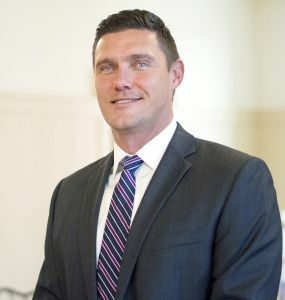 In 2012, he was appointed by the St. Charles County Executive to serve as the Prosecuting Attorney for St. Charles County, he was re-elected in 2014, and is currently serving in his second term at the County’s chief law enforcement officer. In addition, Tim is presently serving as President of the Missouri Association of Prosecuting Attorneys Board of Directors. Throughout his professional career, he has been involved in several community organizations on a volunteer basis, including the St. Charles Community College Board of Trustees, the SSM St. Joseph Foundation Board, the Board of Directors for the Eastern Missouri Law Enforcement Academy, and the Board of Directors for Connections to Success.